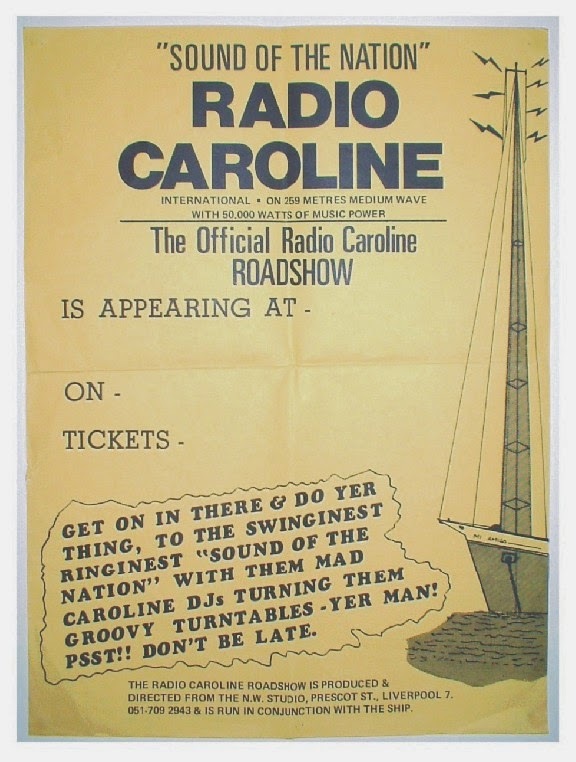 1970s Radio Caroline Car Sticker: Under the Marine Offences Act, display of these was illegal while Caroline was still broadcasting from the North Sea. Like it or loathe it, we all take commercial radio for granted. With hundreds of stations now on air across the UK and an even wider choice available by satellite and the internet, it’s easy to forget that forty years ago the choice of stations was extremely limited. Then the BBC could only offer the ‘Light Programme’ (a precursor to the current Radio 2) as a source of popular music. There was Radio Luxembourg of course, but reception was often unreliable and many of its programmes were sponsored by the big record companies, limiting the opportunities for new artists’ music to be heard. Ronan O’Rahilly was a music promoter trying to find airtime for up and coming artists such as Georgie Fame. The BBC wouldn’t play his records, and neither would Luxembourg – both organisations preferring to air established artists. O’Rahilly became frustrated and hit on an idea which would give him as much airtime for new artists as he would ever need – his own radio station, playing pop music all day. The Mi Amigo in better times. the ship saw service previously with Radio Nord and Radio Atlanta. The station, he decided, would break the BBC monopoly by broadcasting from a ship anchored off the Essex coast. Having convinced investors of the value of the idea, a redundant ferry was purchased and fitted out in Ireland as a floating radio station and renamed the M.V. Caroline. O’Rahilly had seen a picture of John F Kennedy’s young daughter Caroline disrupting proceedings in the US Government and felt that this was symbolic of what he was trying to achieve – hence the name. 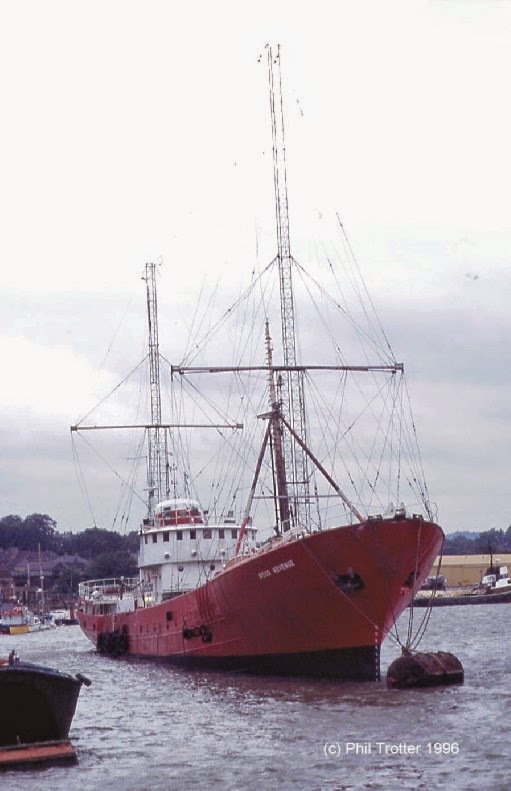 After a short period of test transmissions, on Easter Saturday 1964, presenter Simon Dee opened the microphone and made the first announcement; Radio Caroline was on air and British broadcasting would never be the same again. The postwar change in youth culture with its new-found freedoms and musical soundtrack, plus the availability of a new invention, the transistor radio, meant that Radio Caroline had an audience hungry for its output. Audiences were soon measured in several millions and advertisers were keen to buy airtime to promote their products. Very quickly, more offshore stations came on the air, following Caroline’s example, and each of them broadcasting virtually non-stop pop music, although some also tried a ‘sweet music’ format. Stations such as Radio London, Radio England, Britain Radio, Radio 270 and Radio Scotland were immensely popular with their audiences and their presenters became household names; forty years on, some of them still are. Some stations were even set up in former wartime forts in the Thames Estuary, of which Radio City achieved infamy, as we shall see. 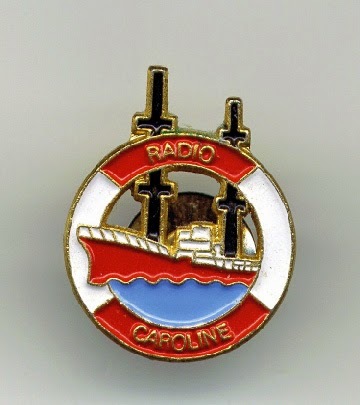 Radio Caroline later merged with its competitor, Radio Atlanta – the original Caroline ship sailing to a point near the Isle of Man to broadcast as Radio Caroline North and the Atlanta ship, the M.V. Mi Amigo, taking up residence in the North Sea as Caroline South. But all was not well. The Government quickly became concerned about the number of ships – nicknamed the ’beat fleet’ – anchored off the UK coastline. Although not strictly illegal, the offshore stations fell outside the existing laws and there were issues surrounding non-payment of copyright fees. The ships also presented a danger to those on board and to the rescue services when they got into difficulties following long periods at sea; in June 1966 for example, the anchor chain of the Mi Amigo broke and the ship ran aground at Frinton-on Sea. The emergency services and foreign broadcasters also claimed that the unlicensed stations interfered with their radio frequencies, although this has never been satisfactorily proven to be the case. Rumours circulated about ‘dodgy dealing’ by owners of the stations, brought to a head that same month in 1966 when a dispute at Radio City over transmission equipment resulted in the death at gunpoint of a former Radio Atlanta official. On 15th August 1967, the Marine etc. Broadcasting (Offences) Act became law, legislation which was intended to bring to an end this chapter of broadcasting history. As part of the overall plan, the BBC had woken up to the new audience and later reorganised its radio business, launching Radio 1 in September 1967 with many former offshore presenters and their slick presentation techniques. 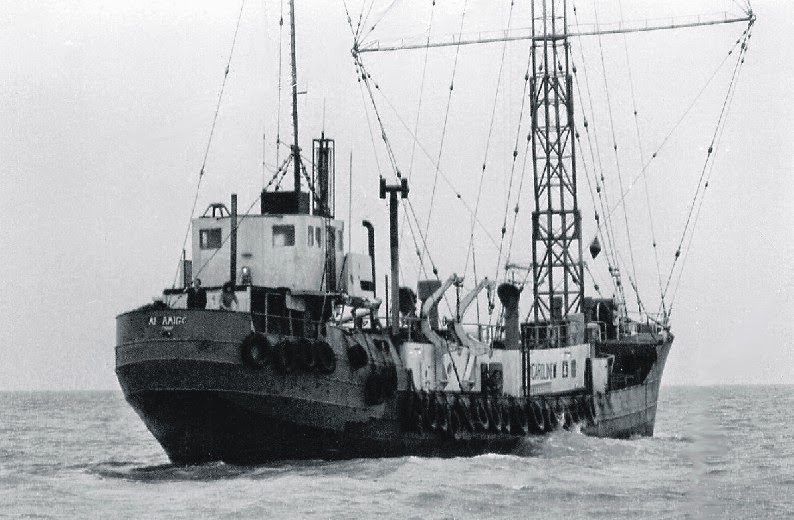 One by one, the offshore stations went off the air and by the evening of 14th August 1967 Radio Caroline, defiantly, remained on air with presenters Johnnie Walker and Robbie Dale on board the stalwart Mi Amigo, playing the civil rights anthem, ‘We shall Overcome’ at midnight. Caroline continued until March 1968 when, in a dispute over unpaid debts, the ships were towed to the Netherlands and that seemed to be the end. A new owner for the ageing M.V. Mi Amigo – originally built as a three-masted schooner in 1921 - emerged in 1972 and Caroline returned to the air, anchored off and supplied from, Holland. 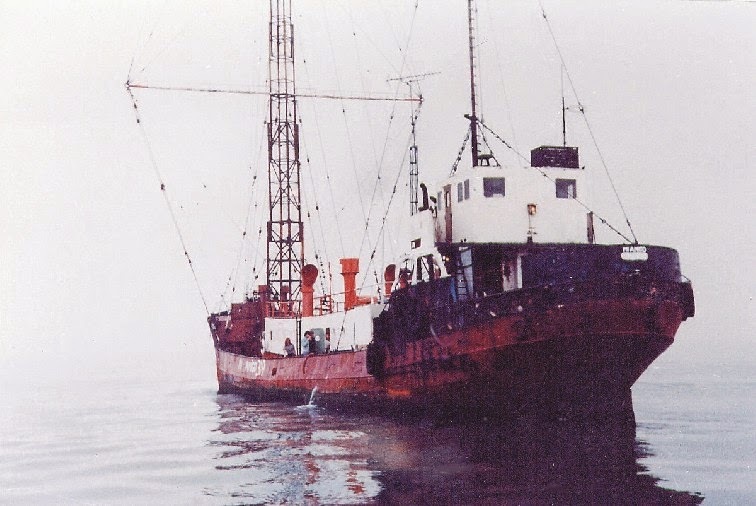 When the Dutch government passed its own offshore broadcasting act in 1974, the Mi Amigo sailed to an anchorage18 miles from the British coast, broadcasting from then onwards as ‘Europe’s first and only album station’ in contrast to many of the emerging UK commercial stations which relied on a repetitive top 40 format. By this time servicing the ship was difficult; tenders were sent out secretly in the dead of night and those on board often endured discomfort for long periods when supplies failed to arrive. Arrests were made on both sides of the channel as a succession of suppliers was tracked down and broadcasts were sometimes broken for lengthy periods as generators broke down. when it was clearly in poor shape. The ship sank in a storm in March 1980. The Mi Amigo was clearly in very poor condition by January 1979 when it began to take water. Incredibly, it survived a force 7 gale on 17th January and eventually Radio Caroline began broadcasting again on 15th April. Throughout the troubled times, certain records and a series of code numbers were broadcast to inform those ashore of the condition of the ship and which provisions were in short supply. By March 1980, things had not improved and on the afternoon of the 19th it became apparent that the ship was drifting. By 9.30pm the ship had reached a sandbank and was being pounded by a force 9 gale, with water pouring in through holes in her hull. 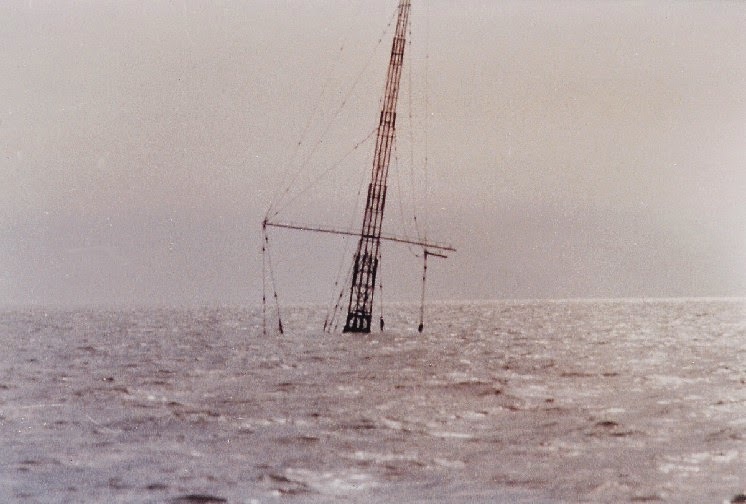 Those on board were taken off by lifeboat and by the following morning, 20th March 1980, the Mi Amigo had sunk, although the huge transmitter mast could be seen above the water for a further six years; a sad end to an amazing piece of radio and maritime history. could be seen pointing skyward for a further six years. As ever, and undaunted by the political odds being stacked against it, the Caroline organisation soon picked itself up. In 1981 a former Icelandic trawler the Ross Revenge was purchased and secretly fitted out in a Spanish port. Its most striking feature was a 300 foot mast, the tallest structure ever fitted to a ship. The MV Ross Revenge moored at Chatham in 1996. Originally an Icelandic trawler, the ship passed to Ross Trawlers Ltd., Grimsby, in 1963. It was sold to a breaker's yard at Teeside in 1977.
for the Mi Amigo which had foundered the previous year. Overall length is 72.64 metres. Once back in the North Sea, Caroline returned to the air in August 1983, much to the chagrin of the authorities who managed to track down and prosecute certain key individuals. The weather, rather that the authorities, continued to cause problems for the station. The ship broke adrift in 1986 and the following year, on 24th November the 300 foot mast came crashing down, again putting Caroline off air. A more modest replacement system was later installed. 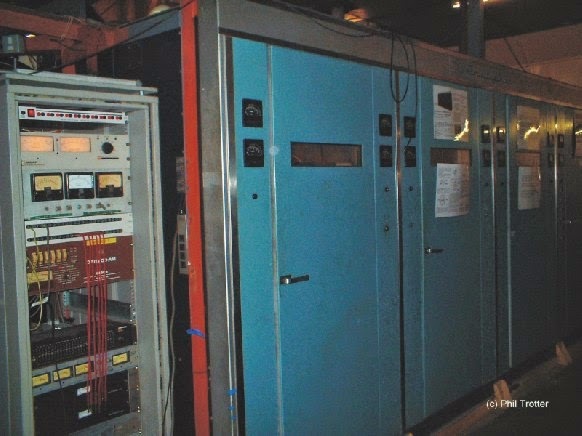 The Dutch authorities raided the ship in 1989, destroying much of the on-board broadcast equipment – a minor setback compared with what had gone before. The main Caroline broadcast studio on board the Ross Revenge. In 1991 the Ross Revenge went aground on the Goodwin Sands and, notably, became one of the few ships ever to be rescued from that perilous location. The ship was later towed to Dover where it was impounded. Today, as Radio Caroline continues, the station is still going. Not from the threatening and dangerous environment of the North Sea, but from a little land based studio at Maidstone. 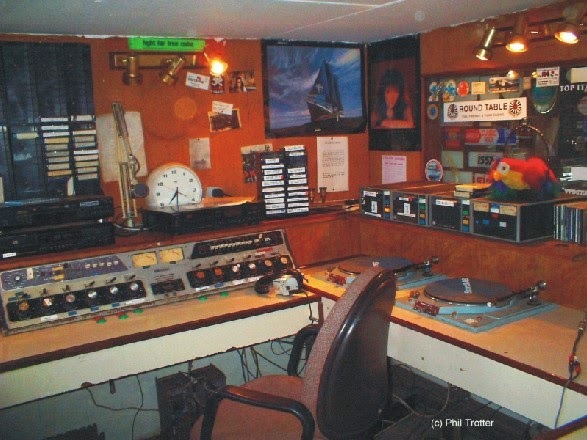 The spirit of Radio Caroline lives on, through the quality of its musical output and the dedicated team of broadcasters, several of whom are stalwarts from the days at sea. New technology means that Caroline can now broadcast – perfectly legally – to a small but committed audience via Worldspace and the internet, without putting lives at risk. Plans are afoot to widen the scope of these broadcasts in the near future so we may well see Radio Caroline in the running as a ‘national’ station again. And the ship? The Ross Revenge survives, currently moored off Rochester, looked after by the Caroline Supporters Association. It is currently being restored and occasionally sees service on restricted service broadcasts. To go aboard is an awesome feeling, bearing in mind the history associated with this amazing radio station, which has survived against all the odds. What for many years was the symbol of defiance is now considered to be a national treasure. the wavelength of 259 metres. Note the reference to 259 metres - which dates it. Mi Amigo Poster: 1970s poster with a view of the MV Mi Amigo in the North Sea. 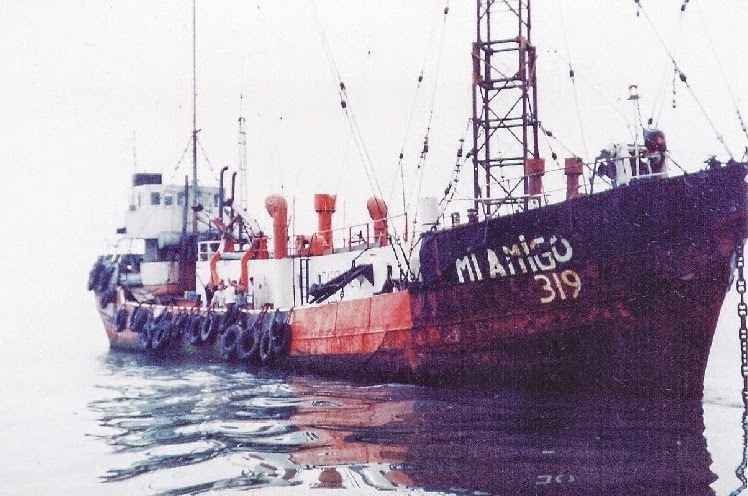 Off-air recordings of Radio Caroline from the MV Mi Amigo in 1979. Time to Meet Caroline: Promotional 7" produced by Bulova Watches in the 'sixties. This primarily was to promote Bulova to the Jewellery trade and included several references to Bulova's advertising and sponsorship on Caroline...thereby indirectly promoting the station!